These crunchy chocolate biscuit fingers are an ideal snack, each packet containing two fingers. 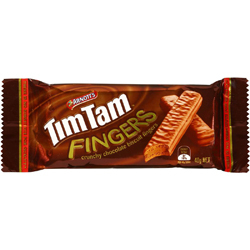 They still have the same great taste of Tim Tams but are longer and thinner. To all chocoholics, the slammers are seriously good. A yummy choc fix when you need it.